Shakespeare is a staple in almost every English class. From Romeo and Juliet to Hamlet, students either love Shakespeare, or they hate him, whether it be the subject matter of the plays or the antiquated language. There are some ways, however, to get more reluctant students more interested in reading the Bard. Okay, so that’s not Yoda or the actual line from Hamlet. However, it is an exciting way for a student to learn and understand what’s being said by Hamlet. Have students interpret and scene or speech from Shakespeare’s play into modern language or the dialect of their choice. It’s a fun way for students to begin to understand what’s being said by the characters and insert a bit of their personality into the lessons. One of my favorite lessons for this activity is to have students work in partners and rewrite the Prologue in Romeo and Juliet in modern language. The sonnets have always been one of my favorite parts of learning about Shakespeare and poetry. However, the rhyming scheme can be a little hard to learn and recognize even after a few lessons. 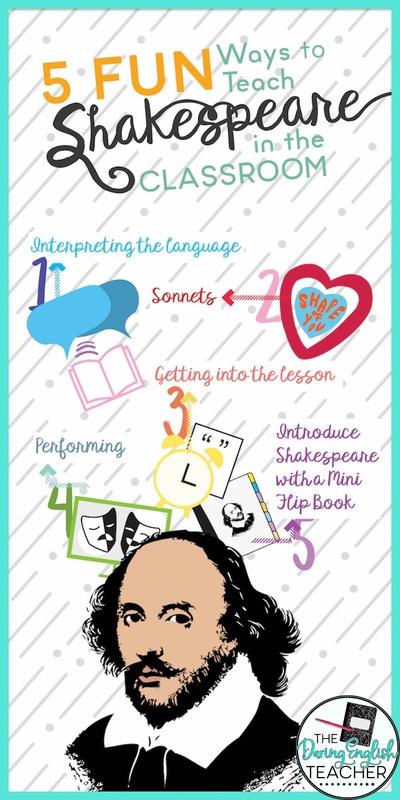 A way for students to learn the rhyming scheme of the sonnets is to look through their music and make it into a sonnet similar to Shakespeare. Ever wondered what “Shape of You” would sound like as a Shakespearean sonnet? It’s also a fun way to be more interactive with students in the class. Have them share with the class or in small groups and enjoy! This activity is an engaging activity to help students learn that poetry is everywhere! Sometimes students just aren’t in the right the headspace at the beginning of class depending on the time of day. They might need a few moments to switch gears before they are ready to begin reading the Elizabethan language. One way to prep students at the beginning of class is to start each lesson with a notable quote from either the play you are reading or something that relates to it and have them write a brief argument, explanatory, or narrative piece. When I teach Romeo and Juliet in class, I begin each day with a Shakespeare Bell-Ringer. 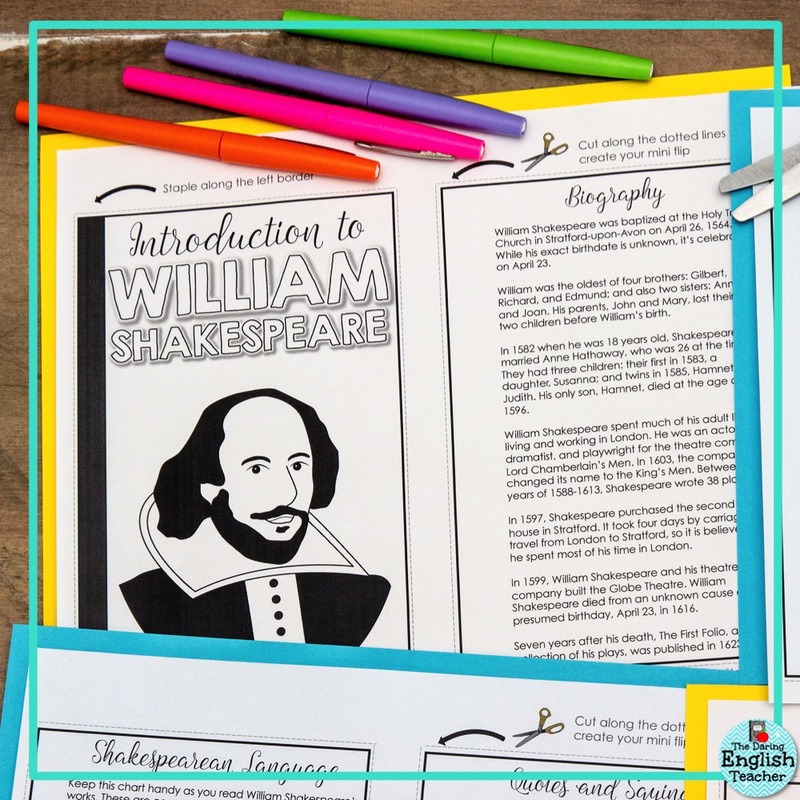 These bell-ringers include 30 different Shakespearean quotes and a quick writing prompt to help spark classroom discussion about the language. Shakespeare is meant to be performed. Most English classes read the plays out loud, but a more fun and interactive way to help students understand Shakespeare is to have students come up with scenes based off the play that can make a more modern version and make to imitate tv shows they’ve seen. Can you imagine seeing the characters of Hamlet on Jerry Springer? Or what about a CSI episode that investigates the death of Julius Caesar! It’d be an interesting interpretation! 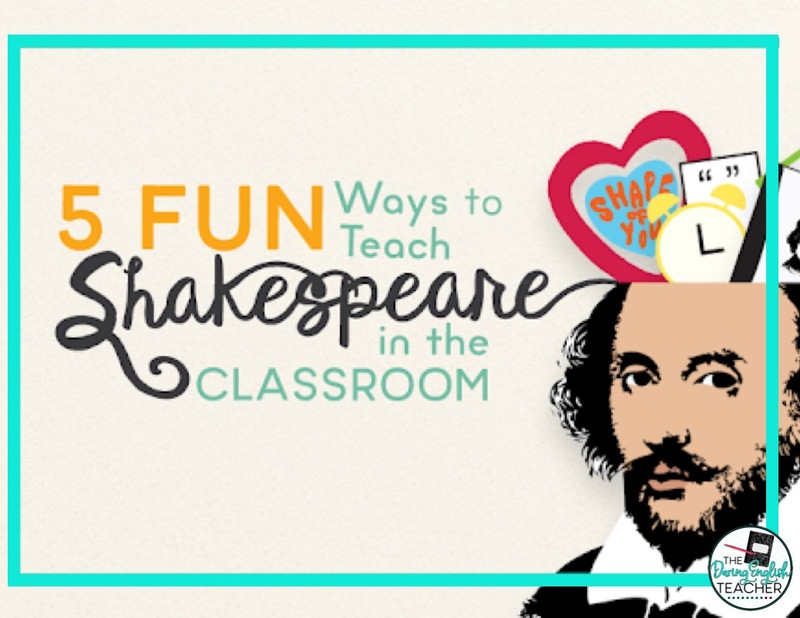 One way to help students become acquainted with the Bard is to spend a day or two learning about William Shakespeare and Elizabethan language. 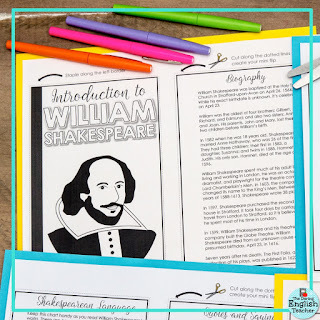 My Introduction to William Shakespeare Mini Flip Book includes several informative pages that will help students when they begin reading a drama. This mini flip book provides biographical information about William Shakespeare, information about the Globe theatre, and it also includes standard Elizabethan language translations and iambic pentameter.